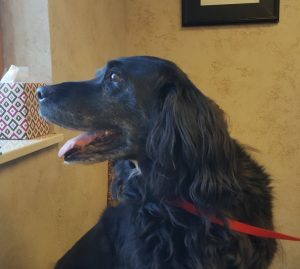 Gabbie is a Senior Spaniel x Retriever and are estimating her to be at least 8 years of age. X-rays show a little arthritis and there is some calcification on her ankle which leads us to believe an old injury which was left untreated. Gabbie’s bloodwork came back good and we hope to get her spayed in the next couple of days. Gabbie needs to be placed where there will be no competition for her person’s attention. If you are interested in this dog, don't delay! Fill out our adoption application now!